Want to know what the lake level is? Wondering when the lake gets lowered in the fall? What about pulse releases due to drought? Keeping track of how soon the lake fills up in spring? This page is designed to help you find answers to all these questions, and more! 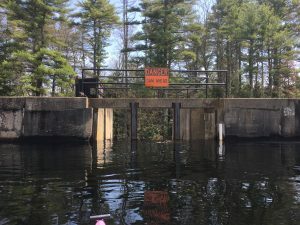 The Pawtuckaway Lake level fluctuates from season to season, as determined by the New Hampshire Department of Environmental Services (NH DES). Thanks to our excellent working relationship with NH DES, the PLIA is able to keep close tabs on water conditions that affect Pawtuckaway. 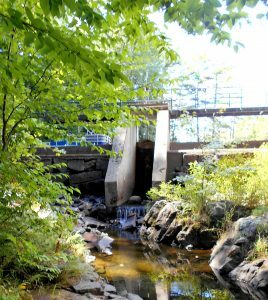 The State manages the Lamprey River Watershed (of which Pawtuckaway is a part) through its 2013 Water Management Plan. So, what is the level? At any given time, you can monitor the current and recent levels of the lake as measured at Dolloff Dam. 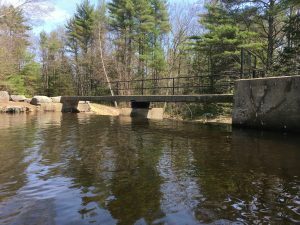 Just click on the Pawtuckaway Lake station that appears on the map at the NHDES River Basin website page, or simply click here. There you will find graphs of current and historic lake levels. The seasonal fluctuation ranges from the summer level (full pool) of 250.4 feet above mean sea level to the winter level of 245.8 feet above mean sea level. Note, the levels are a measure of height above mean sea level. The lake isn’t 250.4 feet deep! Most years the lake level exceeds full pool in the spring. This means the spillways are running and will continue to run until the lake level drops to full pool. During the summer the lake naturally fluctuates within a range just above or below full pool, based mostly on natural events like storms or drought. 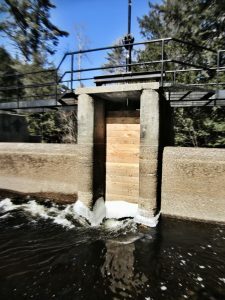 NH DES can also release water if the Lamprey River flow is too low, measurements that can be found at the Lamprey River Newmarket gage. This occurred twice during the 2016 drought. Fortunately, the Water Management Plan limits how much water can be released from the lake during drought periods. 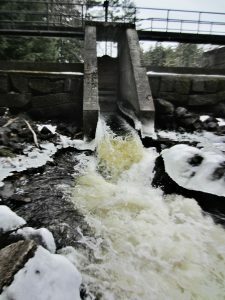 In late winter to early spring the Dam Bureau (part of NH DES) refills the lake by closing the dams. They try to refill the lake at a rate that equals what was done in the past. The refill plan can be modified if, for example, there is too much ice on the lake and refilling could cause docks to be damaged. In the fall the Dam Bureau releases water by opening the dams. They try to draw down the lake at a rate that equals what was done in the past. In 2016 the drought had reduced the lake level by more than a foot. As a result, the drawdown was delayed. An hourly history of the lake level can be found by clicking on the Pawtuckaway Lake station on the map at the NH DES River Basin website page. There are two dams on the lake that control the water level: Dolloff Dam on the south end of the lake and Drowns Dam on the north end. Dolloff Dam uses boards (stop logs) to control the level. These boards are manually placed or pulled by the Dam Bureau. Drowns Dam was recently modified to release water from the bottom of the dam. The Dam Bureau installed a device that lifts the boards from the bottom and allows water to escape from under the boards. Lake levels are determined by NH DES based on years of instream flow research. 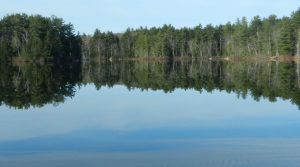 NH DES’s Watershed Management Bureau studied the water needs of the river environment and the water needs of the lake environment to come up with a balanced plan to share this resource. NH DES asked for and received a lot of input from the members of the PLIA and modified the report to accommodate many of our concerns. Thanks to this history, the PLIA continues to enjoy a close working relationship with the DES. PLIA members always have an opportunity to report any persistent problems that result from management of the lake levels through the PLIA.